Archive by category "Adoption and Child Welfare"
Happy Giving Tuesday, the global day of giving! With your help, we can support orphaned children around the world. Your generous gift will have an incredible impact on these kids’ lives. There are many ways you can make a difference! Our 3rd annual Haiti Holidays Donation Drive runs until January 1st, 2018! All proceeds will be used to purchase supplies for the orphanages in Haiti that we work with. You can donate funds or order a limited edition Haiti Holidays T-Shirt to help the children in Haiti this holiday season! The deadline to purchase a t-shirt is December 1st, 2017, so don’t miss out! Are you looking for an easy way to give back? When you shop through AmazonSmile, 0.5% of eligible purchases is donated by Amazon to Great Wall China Adoption and Children of All Nations’ orphan care programs! All you have to do is click on this link to select our organization as your charity of choice. Then, shop like normal and know that with every purchase you make, you’re making a positive impact on the life of an orphan. We appreciate your support! Your charitable donation helps children who have been orphaned or abandoned! Even if you’re not able to adopt a child, you can still make a difference by supporting our global charitable missions. You can make a financial contribution at this donation page and choose to donate in honor of a child, friend, or family member! Our organization is committed to improving orphanages and enhancing the lives of children living there. You can support this cause by donating a gift to a child! Click here to learn more about how you can brighten a child’s day this holiday season with a special gift. The last orphanage I went to during my two week trip to China was in the Guangxi province down near Vietnam. This would be the orphanage visit that would impact me the most out of our entire trip. I’ll get to that more in a minute. While the buildings at this Social Welfare Institute (SWI) were rather large, only one small hallway was devoted to the orphaned children at this facility. The rest of the SWI was focused mainly on care of the elderly. The orphanage section consisted of three small rooms that were connected by an open passage. The first two rooms were lined with metal railed beds and cribs, while the last room had a mat on the floor for playing, a rocking chair and a television mounted on the wall. I was looking forward to coming to this orphanage because I knew there were four little girls under 2 years old with more minor needs and I was looking forward to meeting them. Three of the girls had pre-op cleft lip and cleft palate, the fourth was a little younger and was born very premature. I had a feeling that all four of these girls would be LID when their files were prepared. 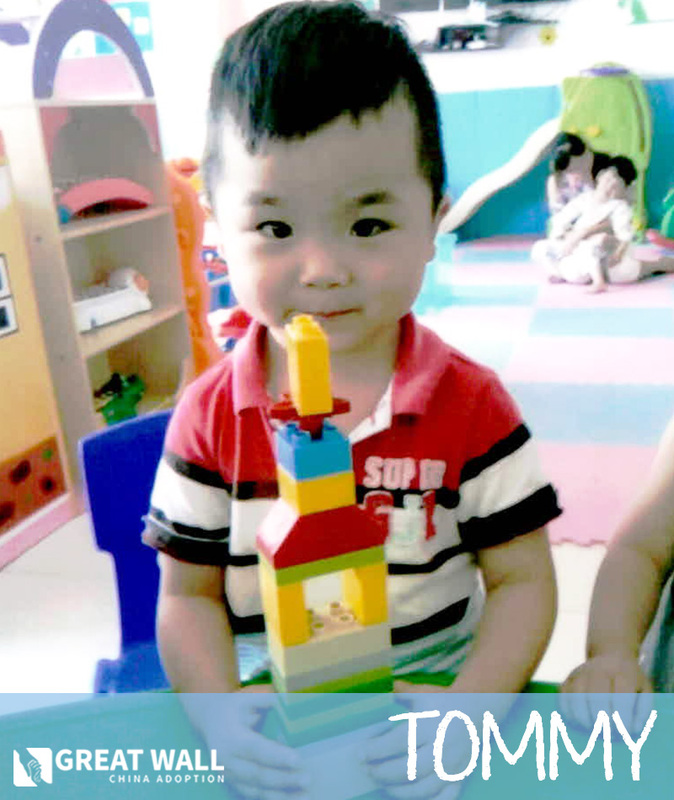 I met at this Guangxi orphanage, and then you will get to review those files. Once you find a file of a child that is a good fit for your family, you will then get matched with that child and then you’ll only have to wait 3-4 months until you can travel to go pick that child up. I can say that for my agency, Great Wall China Adoption, we don’t currently have many LID families because we’ve matched so many recently. So this is actually a great time for families to join our agency, start their paper work process, and get their dossier logged in and then get on the list to review LID files. If a family wants an LID girl, they’ll usually be waiting around 9-12 months after their dossier gets logged in to China before they find a match. However, it could be sooner than that since our LID family list is so short at this present time. It could also take longer than that if a family is only open to one or two minor needs and if they want to review many LID files before moving forward with a child. But the average time is 9-12 months after a family’s dossier is logged in. 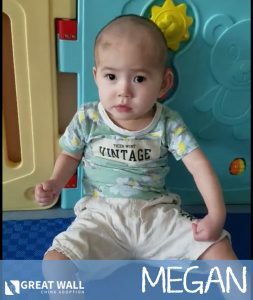 To find a match of an LID boy it’s usually more like 4-8 months, as there are many more boys than girls available in China. 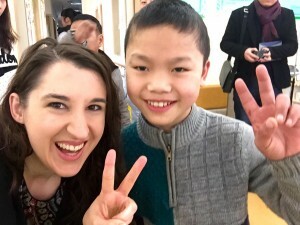 Also many families looking for a younger boy with minor needs can often find one on the Special Focus listing, as China wants to give those younger boys every opportunity to be placed since there are so many of them. In general more families are looking to adopt a girl and there are much fewer girls available in the Waiting Child program, so if a family is open to a boy, they can get matched with a boy much faster than with a girl. So back to what I was saying about these kiddos I met at the orphanage in Guangxi. When I first went to the orphanage it was early evening and the sun was setting. Most of the little kiddos were already in their cribs, some tied to the railings so they wouldn’t try to climb out and get hurt at night. When I first came in all of the children were in shock seeing me because I was almost certainly the first non-Chinese person they had ever seen. I LOVE babies and so all I wanted to do was go up to each and every one of these little girls and pick them up and give them kisses, but I restrained myself because I knew that would probably terrify them and I didn’t want them to get upset. After a little while some of the girls started to smile at me and you could tell they were definitely warming up to me. There was one little baby sitting in a bouncer on the floor who was definitely not a fan of me (she wasn’t one of the four girls I was planning on screening the next day) and she cried every time I looked at her. That’s actually a totally normal reaction for a little 8 month old baby to have, so I understood why she wasn’t a fan of me. I was excited to meet her though because I knew that I would probably be able to help find her a family in the future, even though it would probably be a while from now because she was still too young to get her file prepared. She will probably be an LID girl and her file will most likely be prepared in the next 6-12 months, so if someone was starting the paper work process now, they might be eligible to review her file by the time it it prepared. I had to leave that night after I met the girls and then came back the next morning to screen them. I had the staff take them all out of their cribs and come play on the floor in the third room. At first they were all just sort of starring at each other and all of us. I think the experience of so many people looking at them and giving them so much attention startled them. I also don’t think they get as many opportunities to all play on the floor together. I have a feeling these kiddos, like many orphanages children in China, spend a lot of time in their cribs. I brought some bubbles with me from America and I started to blow them and the girls were all totally shocked by them. I can safely assume that this children have never seen bubbles before and so they were confused by how they were at once there, and then when they touched them they disappeared. It’s so odd to think that they don’t know what bubbles are as this is something we introduce to most American kids at a very early age. I definitely left my two bottles of bubbles at the orphanage after I left, along with several blow up beach balls I brought with me. As I started screening these young girls, it became apparent to me how well they were doing compared to the other children in this orphanage, and many of the other children I had met during my entire trip to China. Once you have screened 100 kids, which I did while I was in China, you can start to tell pretty quickly which ones are going to be LID and which ones will be Special Focus. It’s not that the Special Focus kids aren’t doing well, many definitely are doing well, but LID kids are doing really, really well and their needs are very minor and correctable most of the time, whereas Special Focus kids have needs that can range from very minor to more moderate and then even severe. LID needs that we see most often are things like cleft lip/cleft palate (this is the most common), minor heart disease, microtia, clubbed feet, clubbed hands, general developmental delays and preemies. After spending a couple of hours with these girls I really started to get to know each of their personalities a bit better, and I found in my heart a real fondness for each of them. However, there was one little girl that I became particularly fond of. I will call her “my girl” for the purposes of this blog, even though she is obviously not mine. She was probably the tiniest of the three girls with cleft lip/cleft palate, and she seemed very shy at first, but she had this light in her eyes and this positive energy that just radiated out from her. It was getting close to time to go and I decide to go ahead and pick her up and hold her for a few minutes, because again I love babies, and I realized that after this crazy whirlwind of a trip, this was the last chance I was going to have to get to spend time with these little kids before heading back to the U.S. She was surprisingly relaxed in my arms, even though she seemed very unsure about me just the night before, and so I got a few photos taken of us really quickly. Then Veronica, our GWCA China staff member, said it was time to go, so I started to put the little girl back in her crib. Suddenly, without warning, she tightened her grip on me and pulled in her legs and wrapped them around securely. She started to get upset and started breathing quickly. Veronica needed me to sign something and so I tried to with the little girl still in my arms, but I couldn’t, so one of the nannies literally pulled her off of me and put her in her crib. She started crying so loudly, so I just signed the paper as quickly as I could, and then literally b-lined it for the little girl’s crib and picked her up. When I did she dug her fingers into my shoulders, wrapped her legs around me as tightly as she could, and laid her head on my chest. She immediately stopped crying and I could hear her breathing heavily, her head so sweetly resting on me. I kissed her head and told her I had her, that it was alright. In that moment I felt such a great rush of love for this child, such a sense of wanting to protect her, wanting to make sure she was safe and cared for. I wanted to hold her forever and never let her go. I had kept most of my emotions at bay for the majority of my two week trip up to this point. I had to, because I couldn’t allow myself to feel all of the feelings I had for these kids. I had a job to do, I had to keep it together, I had to do what I was there to do. But after two weeks in China, after meeting 100 kids who all needed Forever Families so desperately, I couldn’t hold back my feelings any longer. Holding her I could feel all of the emotions that I had held back for two weeks flood over me and I could feel my heart breaking into a million little pieces. Veronica told me that we had to go, we were going to miss our bus back to the train station if we didn’t leave right away. I could have stayed in that moment with that little girl forever, but I had to tear myself away from her. I held her in my arms for just one more moment and whispered in her ear, “I promise I will find you a family. I promise.” I didn’t say that to any other child while I was there, because honestly I don’t know how many of the children I met in China we, our Home Finding Team at GWCA, can actually help place. But this little girl, I knew that she was LID and that we could find her a family, or at least I was pretty sure. And I felt compelled to tell her that, even though she couldn’t understand a word I was saying, I just needed to tell her that. The nanny pulled the little girl off of me, and I could feel her desperation as she tried to hold on to me with all of her might. I could feel her nails digging into my skin and her feet tightening around my torso. She began to cry so loudly that I had to walk away to the other room to compose myself. A rush of tears came upon me and I was shaking with sadness, less for me and more for her. She didn’t understand that I was there for a reason, to help her find her real forever family. She didn’t know that hopefully in less than 6 months another woman would be coming to pick her up and take her home forever. Another women would be coming to call her daughter, to hold her for as long as she liked, and to give her the safely, security and love that she had always craved. Before we left I went over to the little girl’s crib one last time and held her hand and said good bye. She was laying down at this point, her face sad and defeated, with tears still streaming down her cheeks, breathing heavily from crying so hard. 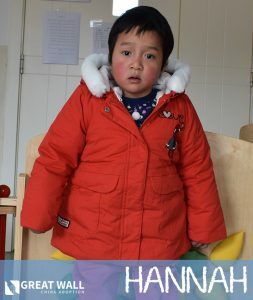 She is the last orphaned child I woudl see while I was in China. We left quickly from the orphanage, got on our bus, then to our train, and then the next morning I would be on a plane headed back to the United States. It would be days before I stopped feeling that little girls nails digging into my shoulders, before I woudl stop feeling the weight of her head on my chest, before I would stop hearing her cries. And not a day has gone by since I have been back that I have not thought about her. You will always be in my heart little girl, and my heart will always be with you. So, the good news, because surely this post about these amazing LID girls must end with good news, right? Well it does! Only a few weeks after I returned from my trip to China we received the files for these four girls! Three of them are LID, one was Special Focus (don’t ask me why, sometimes China just arbitrarily says one child is LID and one is Special Focus, but the truth is they were all doing great and all had minor needs, so whatever). We were able to match all four of the little girls, including “my little girl” as I had started to think of her, within two weeks of receiving their files. Because LID families are already logged in to China, it usually takes them only 3-4 months to get their travel approval and to travel to China to pick up their kiddos. So each of these little LID girls with be picked up by families within the next 3-4 months or so. I can only imagine what it will be like when “my little girl” gets picked up by her new mommy in just a few short months. At first I’m sure she’ll be scared and confused, and she’ll have to grieve the loss of the only home she has ever known. But soon she will be get used to her new mommy, she will get used to the love and one-on-one attention, and she will get used to being held for as long as she wants, as often as she wants. And someday soon she will even get used to her mommy putting her down for a while, but knowing that her mommy will come back and pick her up again soon. That’s what it will be like for “my little girl” when she is then her mommy’s little girl. The day I found out that “my little girl” found her forever family, I wept with joy, right at my desk at work. It was one of the happiest moments I ever experienced at my job, and I have experienced a lot of them, but this one took the cake! This is what I live for, to help families find their children, and to help children find their families. It is what all of the people I work with live for, because it means the world to us, to know that we are really helping people have the lives that they have always deserved to live. I know that whatever I do in this life, I will always have helped this little girl, and many other boys and girls of varying ages and special needs, find the homes they have longed for. For me, there is no greater thing I could be doing with my life at this moment. This is what I love to do and this is what I hope to continue to do for a long time to come. Just weeks ago Heidi, one of our China Matching Specialists, had the opportunity to travel to China to meet with GWCA’s Orphanage Partnerships. While there, she met countless amazing children that are in need of loving Forever Families. Here is a blog about her experience meeting one particular little lady named Eva! I had the privilege of traveling to China a few weeks ago to visit 6 out of GWCA’s 13 orphanage partnerships. I had an amazing time meeting the staff of these orphanages and 99 kiddos from the Waiting Child Adoption Program. I got to experience the unique culture of China including their amazing food (let me tell you about how hard it is to eat with chopsticks though! ), art, language and customs. 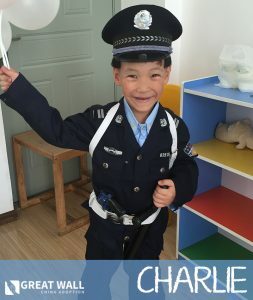 I went to China to meet the kids at the orphanages, learn more about them, and take more photos and videos of them so that when we do receive their files I will have more information to share with families who are interested in adopting them. Some of the orphanages I went to were in big cities and others were in more rural areas. No matter where I went though, everyone would stare at me, including the kids in the orphanages. Most of these children had never met a non-Chinese person before, so they were completely fascinated by me, from the way I talked and how I looked, to how I dressed and even how I interacted with them. In each orphanage as I was interviewing kids, the rest of the children in the orphanage would gather up in the hallway and peak through the windows and doorways at me. When I would turn and wave at them and say “Hello” they would all smile and giggle and run away laughing. And always they would return shortly after to peer into the room and observe me again. One of the things I was the most impressed with was the positivity and resilience of the older children who have lived in the orphanages most of their lives. These are both healthy older children (mostly boys) and children with minor or moderate special needs. The kids I met have such energy and a zest for life that is utterly infectious the moment you enter the room! 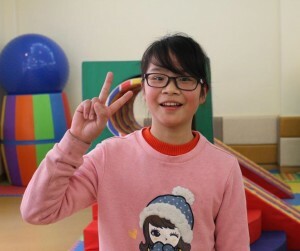 There was one girl, who I’ll call “Eva,” (pictured) that I met while I was in China who is 13 years old and will be aging out of the Chinese Orphanage system next February. Aging out means that a child will not be able to be adopted after their 14th birthday, so kids like Eva will never get a chance to have a family after they turn 14 years old. 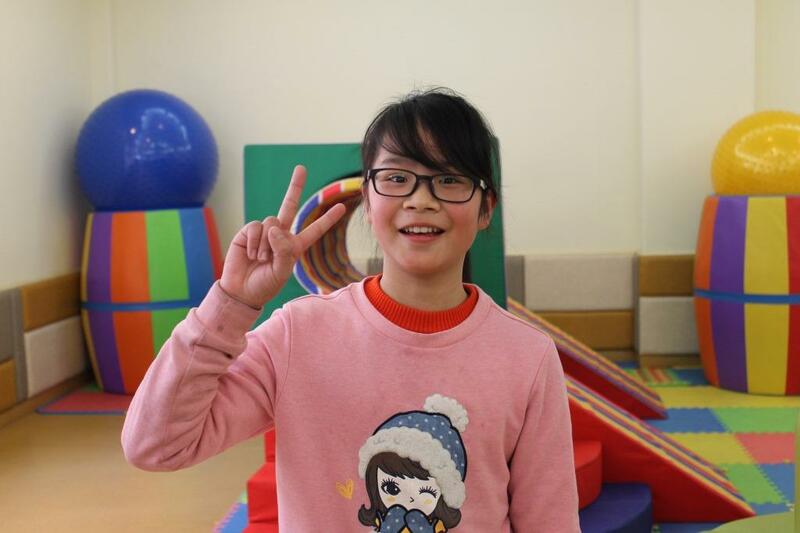 Out of all 99 kids I met over the two week period I was in China, Eva was one that really stood out to me. Eva walked up to me as soon as I entered the orphanage and with a big smile and lots of confidence she said, “Hello! I’m Eva. Good Morning!” Eva was such a happy kiddo, telling me some in English, some through a translator, what her favorite games to play were, that she is in school and what grade she is in, what her favorite sports are and who her best friends are. As you can imagine, after years of not being adopted, Eva really wants to be adopted and have parents and a family. She only has about 10 months left before that will no longer be a possibility. 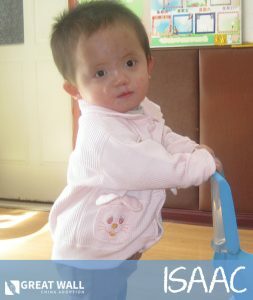 Every day since I’ve been back from China I have thought about Eva and what a special little girl she is. 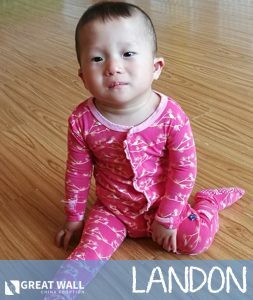 Eva is so very deserving of the love and attention of a forever family, as are all of the wonderful kiddos I met in China. I have been hoping that there is a family out there who will want to adopt Eva and give her the family that she has always dreamed of! Could you be that family? If you are interested in learning how you can become Eve’s Forever Family, visit our photo listing, watch her videos below, or contact Heidi at heidi@gwca.org today. She is more than happy to speak with any interested families about her experience meeting this amazing girl.